After earning the fourth-seed in the WCHA Playoffs after garnering 35 points in WCHA play, the Minnesota Duluth Bulldogs hosts its second consecutive WCHA playoff series. The Bulldogs are receiving votes in both the USCHO.com and USAToday/USA Hockey Magazine national polls after sweeping Minnesota State University, Mankato last weekend to end the regular season. UMD was led by senior forward Katerina Mrazova in the series who posted two goals and one assist. The Bulldogs sport the fifth-ranked scoring offense (2.06 g/gm) and scoring defense (2.38 g/gm) in the league and are the least penalized team in the WCHA (5.2 PIM/gm). Minnesota Duluth boasts the best power-play percentage in the league converting on 21-of-88 chances (.239). That percentage is good for fifth in all of Division I. UMD is fifth in the WCHA in penalty kill stopping 63-of-74 chances (.851). 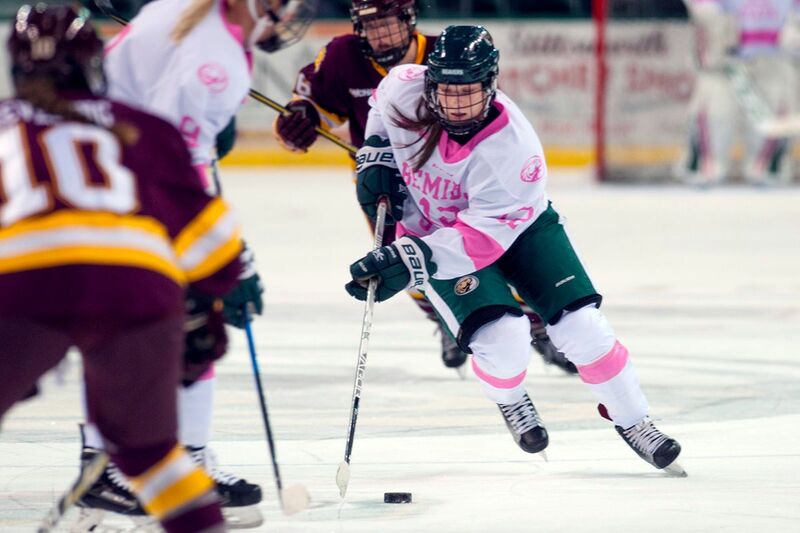 The Bulldogs have one of the best scoring freshman in the league in Naomi Rogge who is third in the WCHA with 15 goals and has compiled 23 points to lead the team. Fellow freshman Ashton Bell follows with 22 points and has scored 11 goals this season while sophomore defenseman Jalyn Elmes has tallied 21 points (6g-15a) to lead UMD blueliners. Senior goaltender Jessica Convery has started 29 of the teams 32 games this season and is 14-12-3. She sports the league’s fifth-best goals against average (2.29) and save percentage (.918) and has three shutouts.